← May 11 – 39 days to go. What’s in your water bottle? May 12 – 38 days to go. Can the plank help you crank? I ride better when my core muscles are strong. I balance better and sit up straighter rather than slumping forward on the bars. 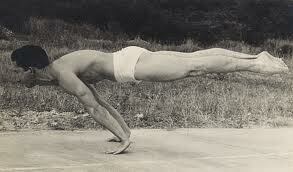 My favorite core exercises include variations on the simple plank position. The plank is simply the “up” position in a push-up — arms and back are straight. Just holding the plank can be a challenge at first. Once you can hold it for a minute, then try some variations. A good start is the side plank — swing onto one arm and point the other arm to the sky. You can also do hip dips in this position which will work your obliques. Another variation involves lifting and moving your legs and/or arms. A simple variation is to lift one leg, swing it out beside your body and then return. Repeat on the other leg. You can also lift, say, your right leg and left arm simultaneously. Then repeat with the opposite arm and leg. Then add in some kettlebells. Hold the plank position with a medium weight kettlebell between your hands. Then pick up the kettlebell with one hand, move it to your side, then return it to the middle. Then repeat with the other arm. You can also work in the BOSU ball. Hold the plank position on the flat side of the ball. Then do some push ups. Then lift one leg and do some more. Once you master all these, you may even be able to do what this guy is doing.